This Sunday, some friends and I ran the inaugural Run 716 in downtown Buffalo. It was put on by one of our local breweries, Flying Bison, and it was a total blast! The race was a 15K (9.321 miles) and hit all the downtown sights: Chef’s Restaurant, Shea’s Performing Arts Center, Canalside, Delaware Avenue, Larkinville, Niagara Square and the marina. 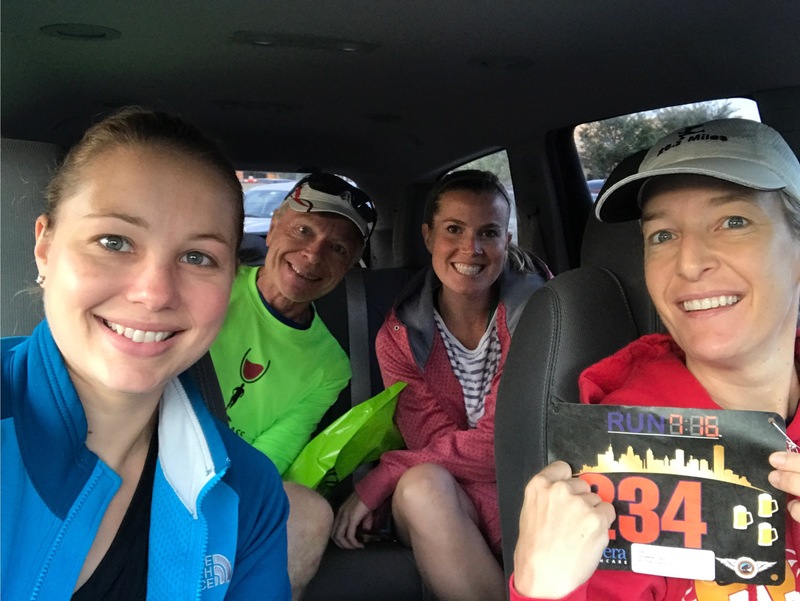 A few of us from the running group met in my driveway at 6:15 am to carpool downtown. 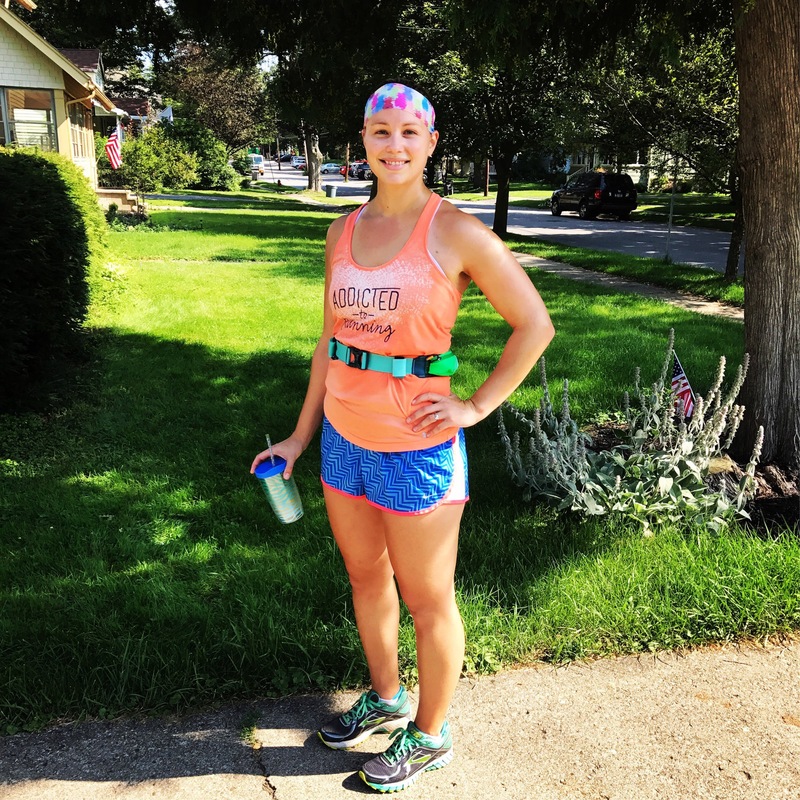 I used this race as my weekly tempo run, having run my long run (20 miles! More on that below) on Friday. My goal was to run sub-8-minute miles, as I’d been able to run a consistent 8:06ish pace for my half-marathon earlier this summer. I ended up running my first mile in 8:02 and the rest were under 8 minutes, with my fastest being 7:49. My average pace for the race was 7:52, which I felt really good about. I came in 7th in my age group, out of 60 other women. My time was 1:13.57 for 9.4 (according to my Garmin) miles. Once I saw the finish, I really kicked it in, so I must have had at least a little gas left in the tank. I’ve noticed that I’ve been able to really push it during these recent races, keeping a steady mile time and working hard enough to be uncomfortable, but not so hard that I begin slowing down before the finish. I loved cheering for the rest of our bunch after finishing, and then we headed over to the post-race party for beers and hot dogs…at 10 am. 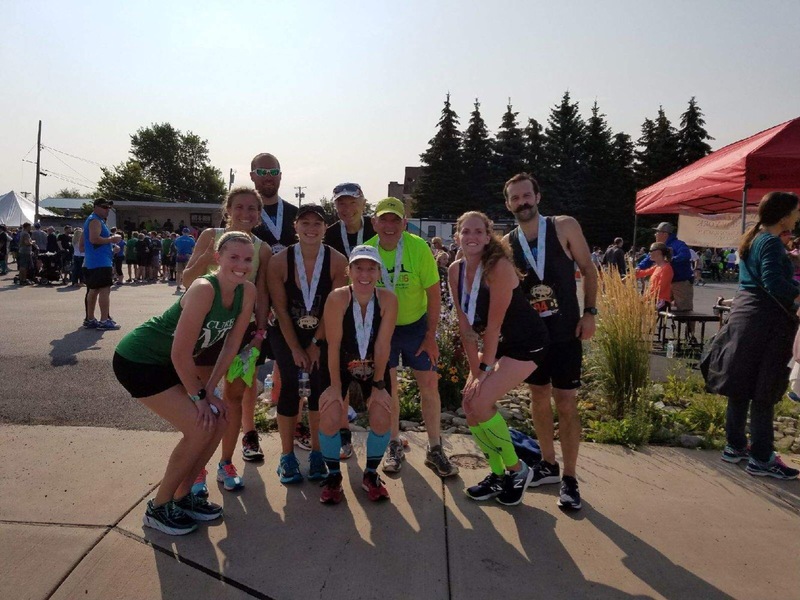 For it’s first year, we felt the organizers did an outstanding job (excellent communication, adequate parking/security/food/beer, good prizes and swag, great course and signage, etc…) and only had a couple ideas for improvement (more porta-potties, Gatorade earlier in the race). All of us agreed that this will become annual event! Some of our group even got some age-group awards, and we even got to rub elbows with the overall female winner, who finished in almost exactly one hour! Incredible! I’m only five weeks out (!!!) from my marathon, and I feel like I’m starting to see the improvement that comes with the training I’m doing. Some of my longer runs have been really tough, often due to the travel I’ve been doing recently, which can sometimes be disappointing. Because I’m using a training plan that includes speedwork, tempo runs and distance, EVERY run is supposed to be hard. One bad run can really get you down, causing anxiety (at least for me) before the next run. However, my recent 20-miler went very well! Obviously, I was tired at the end. But, I had some really decent miles times (starting around 9 minute miles, many at 9:15ish, a few a little slower as I was running with a recently-injured friend, and only my last two miles were slower than 9:30) and I stayed mentally strong. ‘Mental toughness’ is really something I’ve been working on during this season of training, because I know that’s where I struggle. I’ve also gotten some new gear, including this Nathan Mercury 2 hydration belt I found on clearance at TJMaxx, and some new shoes. (More on those in another post!) I absolutely love the belt! I freeze water in the bottles and by the time I need a drink, some has melted. 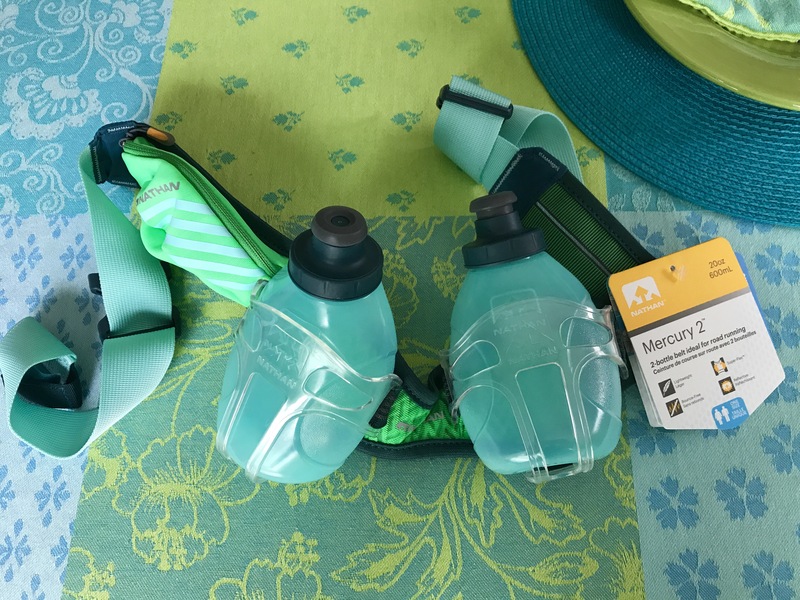 It’s not for super-long runs, as there just isn’t enough water in the two bottles. During my 20-miler, I grabbed it from the freezer halfway through and used it for the second half of the run. It sits high on my natural waist and doesn’t bounce much at all; I can barely tell it’s there. It also has a small pouch for gels or your phone. 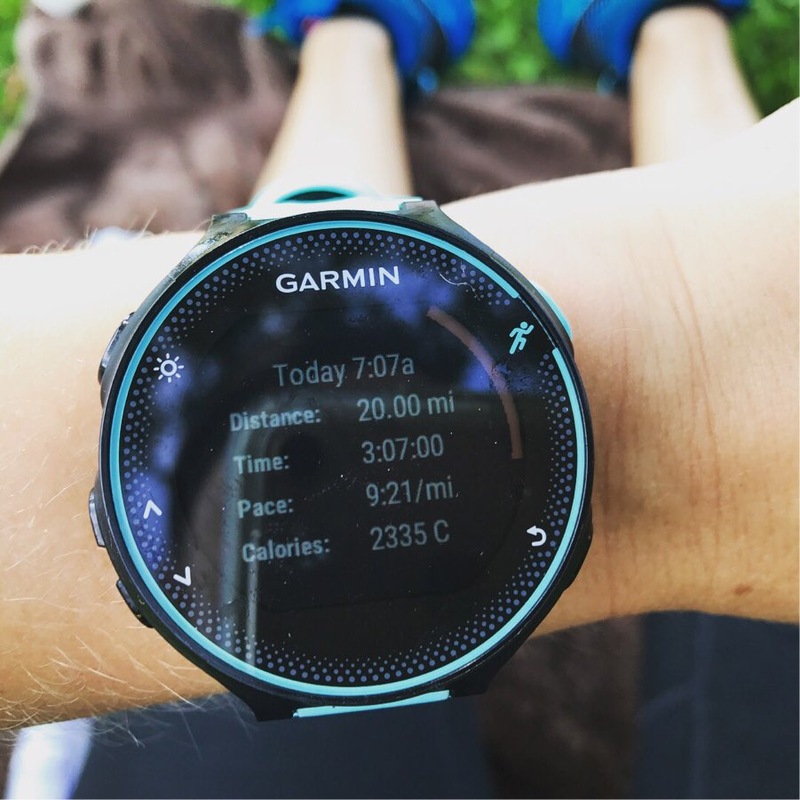 How is YOUR summer running going? 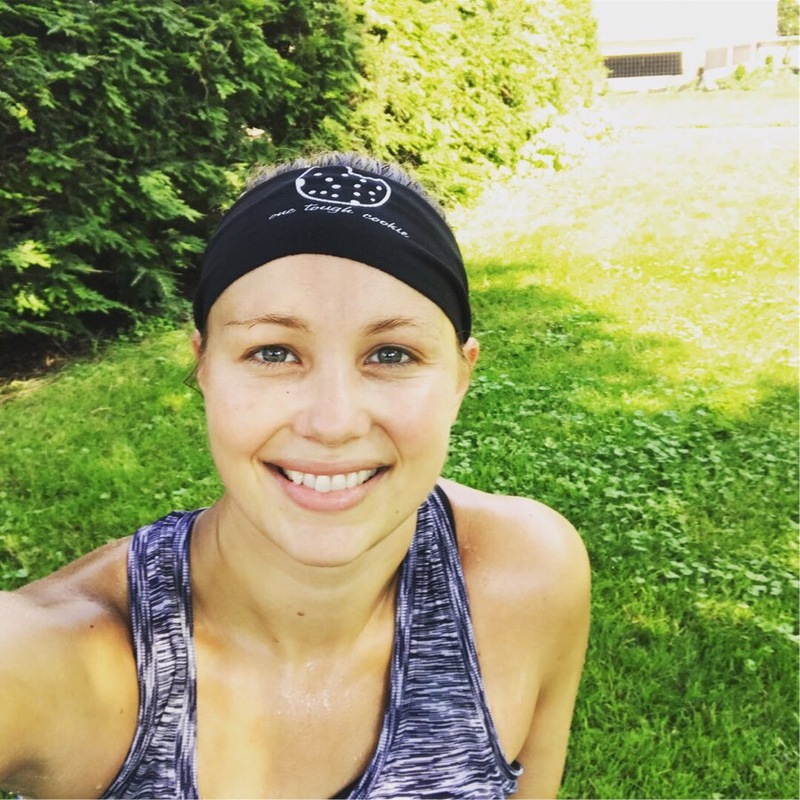 Posted on August 7, 2017 August 7, 2017 by thehealthypineapplePosted in i ♥ runningTagged 15K, 20 mile run, 9 mile run, erie marathon, Flying Bison Brewery, hydration belt, marathon training, mental toughness, Nathan, Run 716, Running. Next Next post: my little bro is getting married! HAHA!! Thank you! I saw this comment before my run this morning, and it really buoyed me for my speedwork!! It just cracks me up!